Two giant pumpkin spice cookies stacked on top of each other with white chocolate chips, pumpkin spice chips and cream cheese buttercream, yes please! My birthday is coming up really soon (when I make this post) and I've been really into pumpkin spice everything this year so I decided to make my own birthday cake and I'm making it into a cookie cake. Also I can't find store bought pumpkin spice cakes or cookies that are worth the calories. Growing up for my birthday my mom would always get my a cookie cake, I wish I still had some pictures of them from years ago, she got it for me because one I was a very picky eater growing up and two who doesn't love a giant cookie. I've already made some tasty Pumpkin Spice recipe and if you love it as much as I do click on the underlined to go directly to them: Pumpkin Spice Cheesecake Pop Tarts, Pumpkin Spice Sugar Cookies, Pumpkin Spice Pound Cake, Slow Cooker Pumpkin Butter, Pumpkin Spice Syrup and Pumpkin Spice Extract. 1. In a large bowl, cream together unsalted butter and sugar for 5 minutes or until light and fluffy. In a separate bowl, whisk together flour, baking soda, baking powder, sea salt and pumpkin spice. 2. Add pumpkin puree and vanilla extract to butter-sugar mixture and mix for 1 minute. 3. On a lower setting, add a quarter of the flour mixture then one egg. Add another quarter of the flour then last egg. 4. Toss white chocolate chips and pumpkin spice morsels to the last quarter of flour then add to the dough. 5. Place cookie dough in refrigerator for 30 minutes to 1 hour. 6. Preheat oven to 325 degrees. Cut parchment paper into a circle for the bottom of one of your 10 inch springform pans. Bake for 25 to 30 minutes, rotating halfway through baking. 7. While the cookie is baking whip up cream cheese buttercream, mix cream cheese, softened butter and vanilla bean until light and fluffy about 5 minutes. Set your mixer on low, add in confectioners' sugar at one cup at a time. 8. Let cookie cake cool in pan for 10 minutes then transfer to wired rack to cool completely. 9. Spoon on a layer of buttercream on the bottom cookie then pipe the rest of your buttercream on the border of the cookie cake. What a fun birthday treat! I'm always looking for new and creative sweet treats! Love this! I've never heard of a cookie cake but it sounds delicious!! Love the idea of a cookie cake, how fun! Yum! These look delicious! Saving for later! Happy Birthday! You had me at "cream cheese buttercream" and "pumpkin spice everything". That pretty much describes my cravings right now. Your pumpkin spice cookie cake looks absolutely divine! Beautiful looking treats for the season; I love the Fall / Autumn because of all the deliciously themed sweets! Looks amazing, will defiantly be adding this to my list of recipes to try. Pumpkin is one of my favorite flavors, so this looks like something my family and I definitely to try! You are rockin' it with all the pumpkin spice recipes this season! Yummy! I've never tried pumpkin spice cake before, but it looks interesing. I would definitely give it a try! Wow This look so delicious. Great idea!! woah! this looks awesome!! wish someone would make this for me for my bday ;) I'll eat the whole thing and not share haha. Cream cheese and pumpkin I'm already in love!!!!! This looks and sounds delicious! A great holiday treat- will definitely be trying this out! O-M-G!!!!! Yes, I loooove pumpkin anything! This looks beyond incredible, what a fun way to share a cookie :) I have a couple of nephews who I know would love to take a bite outta it. Yummy, I can just imagine how absolutely delicious this must be! Perfect f or this time of the year. Who doesn't want two giant cookies for their birthday? Such a fun and clever dessert! Wowzers. You are going to turn me into a pumpkin lover haha! This one sounds perfect! I love your creativity! 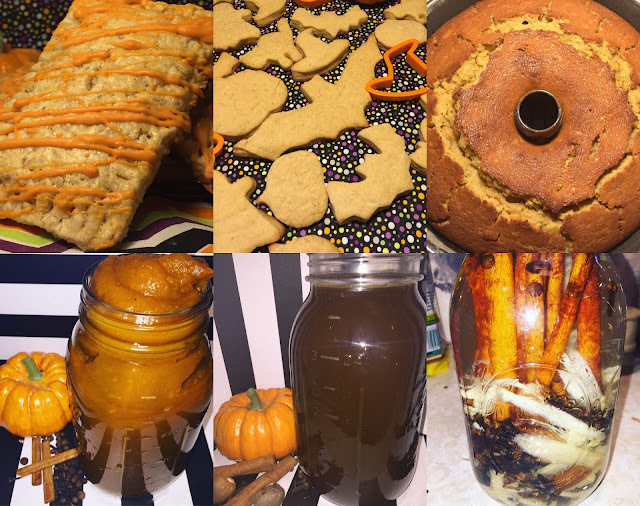 So many interesting Autumn-inspired recipes here! It's very interesting and looks very tasty! thank you for sharing!